Yes it’s true, Nellu has been talking about chicha since we were still in New York. I think he was first introduced to it while watching one of the adventure eating/drinking shows and thought, “Wow, that’s weird. I definitely want to try that.” He will try anything at least once – the weirder the better. I think Santiago sticks in my mind as the place where chicha’s role in our daily conversation hit a new high because we were staying with two lovely American women who had recently traveled through Peru and Nellu wondered if they had in fact tried it. What Nellu leaves out of his story is the fact that when – as he put it “a miracle happened” and our bus returning home from the Inca Trail passed right by the chicharia (or place that makes chicha) – I was dying in the back of the bus. As fate would have it, I got sick on the last day of our hike to Machu Picchu. I won’t go into detail but it was the type of brutal sick that travelers often get when exposed to foreign elements in their food and water. So after getting up before 3am in the morning, hiking 6km to Machu Picchu, trying to eek out every last bit of spirit I had to actually enjoy and see the ruins, then taking a bus to a train to a bus without consuming anything more than two Gatorades and a few crackers, I was happy to be on the way back to our hotel. Nellu had been an absolutely trooper the whole day, staying by my side to help me with the hike, running to get me water or Gatorade or anything I needed. From time to time he would give me that look that he sometimes gives me when I am sick, he can’t help, and he secretly fears that I may die. It’s that look of sheer despondency that you usually see in movies when someone is in fact dying…from the plague. He gave me the look a lot that day. So you can imagine my surprise when, as the sun was setting and I was curled up in the fetal position on the back of the bus, I hear, “Hey! Is there any chance we can stop at Mercedes’ chicharia !? !” coming from my worried husband’s mouth. Part of me wanted to shout back, “You’ve got to be kidding me.” But I didn’t. I knew how much Nellu wanted to try it. And he had come so close so many times. 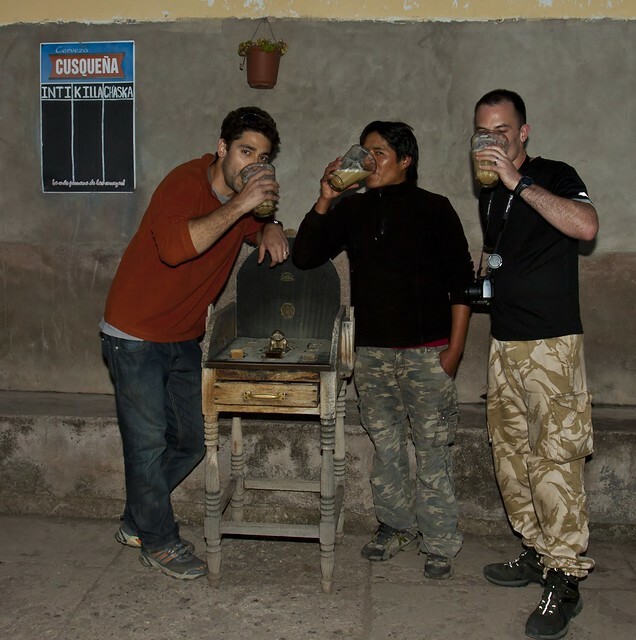 The first night we arrived in Cusco before embarking on the Incan Trail, we even ate at a place called Chicha. But alas, they did not serve the drink. And all through out the hike, there were chicharias on the way where the porters would stop to refresh. It was almost like the chicha was teasing Nellu throughout the whole trip. So being the good wife I am, I said nothing and the bus stopped. Usually, I would have been right there with Nellu trying the chicha. I definitely wouldn’t have had a whole glass like he did (he wants me to make sure you know that it was a monster mug and not a small taste like some others had) but I would have tried it. I may not be so adventurous when it comes to food but usually with drinks, I’ll take at least a sip. And besides, I would have gotten the opportunity to improve my skills at the drinking game “el sapo.” This is essentially the Andes version of Beruit where instead of tossing ping-pong balls into keg cups, you hurl metal coins at a table aiming for the mouth of a small metal frog and rack of points based on your accuracy. The loser buys the next round of chicha. This is the line that currently echoes in my head. Molly has said it several times to me since we left Santiago. I can’t remember precisely when but I think it was more like Buenos Aires or even as far back as Rio (Lance & David can collaborate on this if they know??). Realistically, it was probably several months ago in NYC before coming face-to-face with reality. I think I told everyone I met, my intention to find a chicharia and drink some chicha. This is my story and though it has been done before, this one is mine. 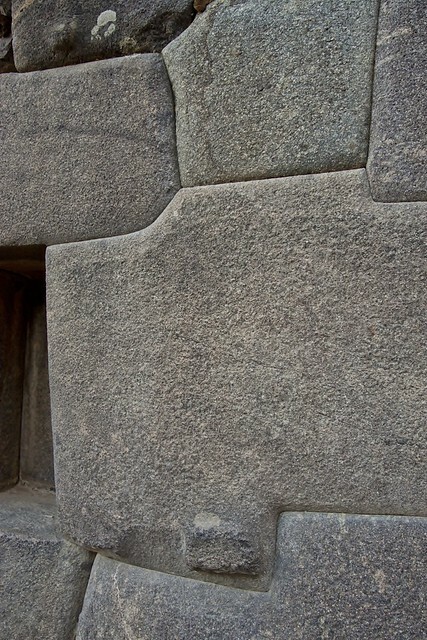 The Inca Trail is a 45KM, 4 day hike to Machu Picchu along the paths created by the Incas, which connected outposts to cities and cities to each other; but that is another story. This post will be about chicha. Near the town of Ollantaytambo on the way to the start of our hike, our guide (Rivelino) delivered a query which had been already answered at some point earlier in the day when I had mentioned chicha several times by name. We would be stopping at a nearby chicharia (place where they make chicha) and find out how it was made. As we neared the establishment, I noticed the familiar red bag on the end of a stick in front of a house. This is a business marker indicating chicha is being sold here. Before we could taste any chicha we would first have to see the guinea pig pen. Guinea pig is a delicacy in Cuzco and is generally only eaten at special occasions. It can be quite expensive; 80 Soles for the one we tried at ChiCha restaurant in Cusco. It tastes a bit gamy, with a texture reminiscent of a mixture of rabbit and duck. Photos of dinner can be seen here, but it’s not pretty. But I digress, the topic is chicha. We were stopping at a well known chicharia owned by a woman named Mercedes. Inside the chicharia, Mercedes spoke and Rivelino, translated. 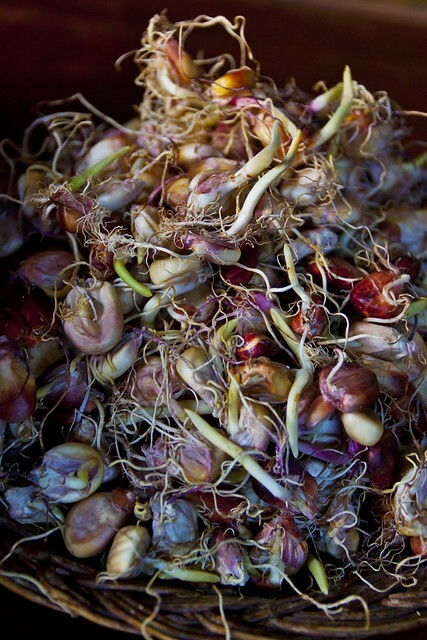 The chicha that Mercedes makes is produced from the germination of seeds of corn (several varieties) that are then boiled/mashed and then strained through straw into containers for fermentation. 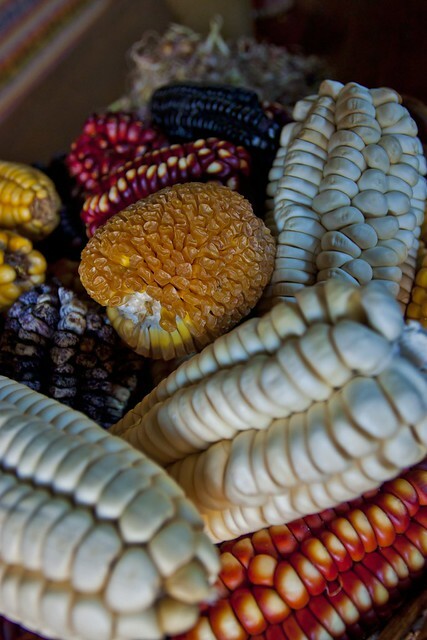 We were first shown the corn, followed by a basket of germinating seeds. Next Mercedes demonstrated how she mashed, boiled and strained the product into chicha. She was even going to offer us a taste (which I picked up via my limited Spanish),but Rivelino intervened. He did not recommend that we partake because of nature of chicha itself. 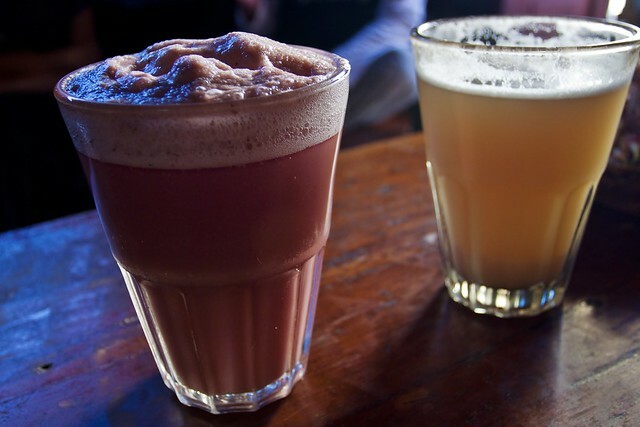 Chicha is made with local water, is alcoholic(does not mix well with the altitude) and contains yeast that continues to ferment even after drinking. He simply did not wish for anyone’s adventure to be horrid or worse, end before it began. The rejection was brutal, but I hoped there would be another chance in the future. The future came quickly enough, mocking me throughout the climb as every porter and local was drinking chicha at various stations along the trail. Many of our porters ran the trail while wearing open toe sandals and carrying 25 KG of cargo on their backs. These men would repeatedly show great feats of strength and endurance as they ran past us each day to setup the camp when we arrived at our lunch and dinner breaks. Perhaps there’s something to the chicha mystique after all.At the end of the hike, I had become despondent as we only had 1 night and 1 day left in Cusco to find and try chicha. I had some leads, but nothing solid. Then a miracle happened. Realizing that the road back to Cusco passed Mercedes’ chicharia, a sole plea was made for a quick stop. This would be a great reward to have climbed to the top of Machu Picchu and then return to sample chicha. That one voice grew into a cacophony of support and the bus stopped. This is how I like to remember the incident, in my mind anyhow. Chicha is an acquired taste and not for everyone. I had just came from Chile, so the terremote was similar and not too different from tulburel (newly fermented Romanian wine). Both denote homemade spirits with active yeast, which means it will continue to ferment even while in you stomach. Mercedes happily greeted us and I get rounds for everyone that wanted it. Chicha is cheap, costing between 1-2 Soles. Drink as many as you like. It is cheap, because they play a drinking game called ‘el sapo‘ (the toad), which can drain you of your Solesquickly, especially after a few rounds. More on that later. Chicha is between 2-4% alcohol, tastes a bit like sour beer and smells eerily like boiled cabbages juice. Anyone who has had one of several American craft beers made with wild yeast, will have an idea of what this tastes like. After several gulps your mouth adjusts and you may find that you are actually enjoying it. It is not a heavy drink, but do not be fooled. I only had one but I definitely felt the affects. Most that drank it found it to be interesting, but not interesting enough to finish. I downed every drop of chicha and the rest is history. I can’t recommend you drink this as only you can make that decision for yourself, but I have no regrets.